I am not usually one to complain about how my local tax dollars are allocated. However, as I was driving along the I-696 West highway this morning in Farmington Hills, Michigan (outside of Detroit), I saw a new sign that almost made me drive off the road. I'm guessing that there was not a lot of consultation before this new sign was produced. It is a highway exit sign that lists local lodging and attractions in the area. 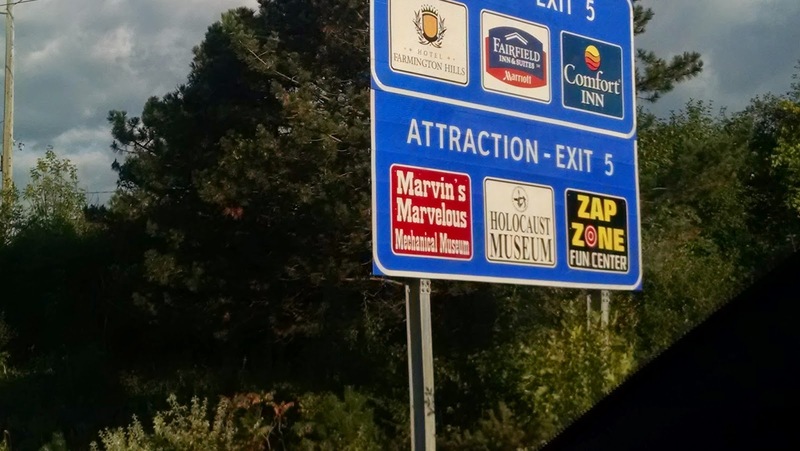 The top half of the sign has three logos of hotels just off the highway, while the lower half of the sign bears the heading "ATTRACTION EXIT 5" and then displays the logos of a well-known local video arcade, Marvin's Marvelous Mechanical Museum, and Zap Zone, which has mini-golf, go-karts, video games and Laser Tag. In between those two logos is the logo for the Holocaust Memorial Center, which is the nation's first Holocaust museum. What?! I couldn't believe my eyes. This immediately struck me as tacky and distasteful. A museum that stands in memory of the six million who perished in the Shoah shouldn't be in the same "attraction" category as places where little kids have their birthday parties. Sitting in traffic waiting to exit, I grabbed my phone and quickly shot a photo out of the passenger side window of my car. And then I drove on and saw a second sign. This one -- a vertical sign -- again listed the three "attractions" with the Holocaust Museum in between Marvin's and Zap Zone. I pulled to the side of the road to take another photo. I understand that there are other ways to look at these signs. Some might acknowledge that it's wonderful that the Michigan Department of Transportation (MDOT) -- or whichever agency erects these signs -- is interested in publicizing Detroit's Holocaust museum. The fact that the Holocaust Memorial Center is listed as an "attraction" took me by surprise, but it is in fact a local attraction -- just not in the same category as places that offer Laser Tag and Skee-Ball. Even listing a Holocaust museum on the same sign as hotels strikes me as out of place and poor judgment. I think the best course of action would be to repaint these signs listing hotels in one category and fun attractions like Marvin's Marvelous Mechanical Museum and Zap Zone in another category. A sign for the Holocaust Memorial Center should stand separate from the other businesses to avoid anyone from thinking the intention was to group a serious museum dedicated to educating about the Holocaust from two amusement centers. Prior to the erection of this sign there was a non-descript green sign showing the Holocaust Memorial Center was 0.4 miles away and that seemed to get the job done just fine. UPDATE: It was brought to my attention that the Michigan Department of Transportation sells this advertising space to local businesses as part of the Tourist Oriented Directional Sign Program. 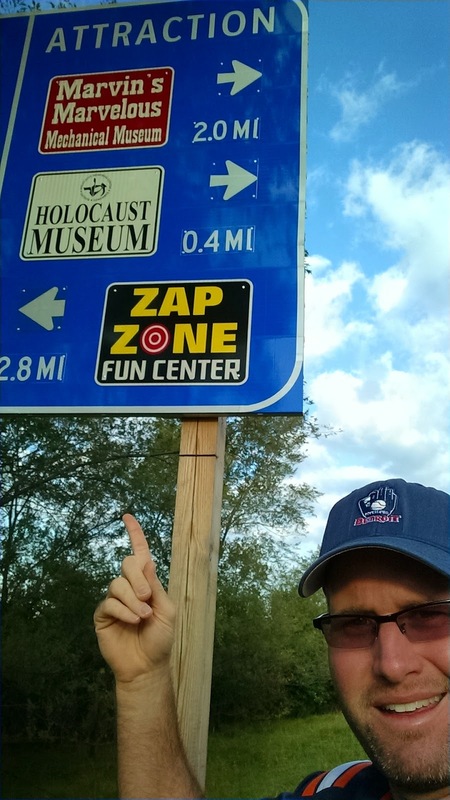 Even if that's true and Detroit's Holocaust Center paid for their logo on the sign, I don't think they expected to be sandwiched between these two places parents take their kids for a fun afternoon. Rabbi, I disagree. Those signs serve an important purpose for travelers. If you are not from the area and you are looking for anything from a hotel to gas to any type of attraction (serious or fun) they are extremely helpful. In addition, they make travelers aware of opportunities that they may not know about. Does the museum belong in the same category an arcade? Maybe, maybe not? If that is the only choice available then they are smart to take what they can and maximize on the opportunity. Highway signage is first and foremost informational signage for drivers blowing by at literally a mile a minute or faster. If the Holocaust Museum feels that it is being poorly represented or disrespectfully represented it can have its listing removed from the sign. If they choose to create and pay for a sign unique to their attraction and place it on the highway (i.e. a billboard) that surely is their right as well. I have to assume that while no disrespect is intended, the other attractions at that exit have an equal right to have their information provided to passing motorists as well. We're not mixing milchicks and fleishicks here. And as a final thought on the issue of respect, please note the respect involved in creating a Holocaust Museum in the first place. I agree with the first two commenters and think you are making much ado about nothing here. Out of curiosity, are you the only one making something out of this? Or are there other bloggers or new articles that also point it out as an issue? It's probably a good thing the Museum wasn't closer to the Detroit Zoo.